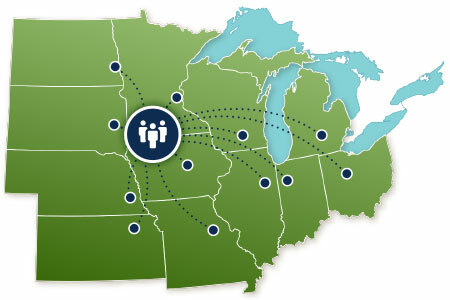 The North Central Region Water Network is a 12-state collaboration designed to enhance connectivity across regional and state water projects, develop and carry out integrated outreach and education efforts, and coordinate projects with measurable short and long-term environmental and social impacts. The network is overseen by an Extension based regional director, a team of Extension appointed state contacts, and a regional administrative council comprising state Extension directors, university personnel, representatives from state and federal agencies, business and industry representatives, NGO staff, and researchers/educators with water-related expertise. Support is provided by an experienced team of administrative specialists representing multiple partner institutions. Learn more about the network. We work together to ensure safe and sufficient water supplies by increasing the scope and positive impact of multi-state water outreach and research efforts in the North Central Region of the United States. Strengthen the resource base available for Extension education. Extension provides a critical bridge between applied research and the people, organizations, and communities that can use that research to strengthen decision-making. We are recognized leaders in lifelong learning and citizen engagement, resulting in safe, accessible water supplies and sustainable, resilient communities. Read more about our impact in our newly developed Impact Report. The North Central Region Water Network is funded by generous contributions from Extension Directors at all 12 North Central Region land-grant universities.